Well I’ve avoided it long enough. It’s time for a discussion of the top knot hairdo on men. It appears to be here to stay, for at least longer than I thought it would stick around. 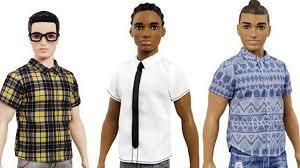 Especially since Mattel has decided to honor it with a Top Knot Ken doll! Will the top knot one day be ridiculed and reviled as the mullet is now or will it become classic standard hair fare? When I first saw this thing I must admit I thought it looked hilariously ridiculous but today I saw a handsome young lad with a top knot and he really looked quite fetching. But therein lays the trick. If one is as handsome as this guy was, he can pretty much pull off any hairstyle and still be handsome. But can an ordinary looking guy actually improve his looks and style-points with such a do? When you are in chat rooms seeking local singles do you ask if those you are interested in wear their hair that way? Is it important to you how men wear their hair? Would you ever not date someone because they had what you considered to be a weird or odd hairdo? What about a comb over? What about a giant red and green Mohawk? Would you ever suggest to someone that they should change their hairstyle to be more attractive? It is a tricky sitch’ for sure. I honestly can’t see myself ever suggesting to my man to grow his hair long and wear it up in a bun. But then again if I had the chance to meet this handsome top bun guy today, I would have accepted him, hair pile and all. So isn’t that the real point of a hairdo? To make one feel confident and express themselves and that way they become attractive to others? Myself I like to keep it in the mid zone, slightly stylish with a nod to current trends but I do have to admire those confident enough to fully embrace current styles. It certainly makes for some interesting photos over the years to watch yourself changing with the many trends that come and go. Certainly this style conveys confidence and that is always in style. Sorry, can’t say the same for the comb-over…. Love yourselves and live in the light!